Default valueYour browser does not support HTML5 video tag. Contrary to the conventional process order, the production of ABSOLUT-ID cards starts with generating the personalisation image and data in continuous tone quality‘underneath’ the security pre-print. 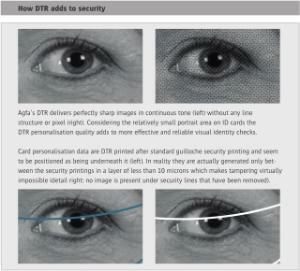 This makes ID data inaccessible for tampering while Agfa’s DTR technology itself has such a degree of complexity that counterfeit is virtually impossible. Because DTR allows to print personalisation data before other card security features the ABSOLUT-ID production process avoids the traditional long and costly preparation time, while yet substantially contributing to increased security levels. 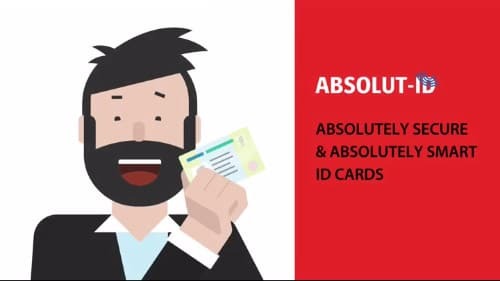 The production of ABSOLUT-ID cards is web-based and is achieved within one automated machine that integrates all production steps in one single environment to deliver cards with all required security features. The single environment approach avoids the sequential and geographically distributed card preparation known from production via coupon sheets. As a consequence, there is not only a gain in production time and efficiency, but also the cost can be eliminated of secured transport and storage of semi-finished cards waiting for personalisation. 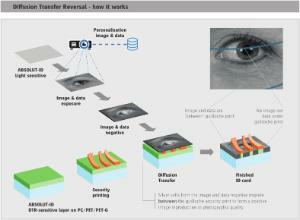 The equipment for one-click integrated production of ID-cards has been developed by LCsys, France, an acknowledged expert in image processing and the production of security cards. E-mail our webmaster if you have questions or problems regarding this Web site. © 2018 Agfa-Gevaert Group. All rights reserved. Last updated on : 7th December 2018.